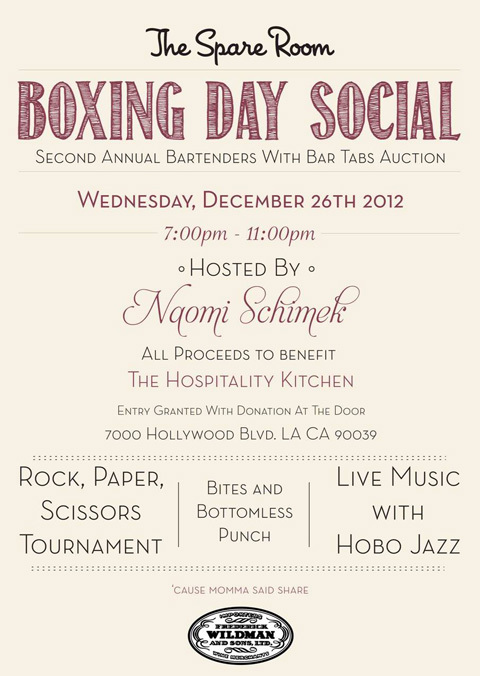 On Wednesday, December 26th, the 2nd Annual Boxing Day Social is taking place at The Spare Room, where Beverage Director Naomi Schimek is spreading some holiday cheer by donating all proceeds from the event to the Hospitality Kitchen (aka the “Hippie Kitchen”), a soup kitchen operated by Los Angeles Catholic Worker. The Hospitality Kitchen feeds, cares and advocates for the homeless population in downtown LA. The suggested donation is $15 at the door, and clean blankets, coats and sleeping bags are accepted as well. Donation includes bottomless cocktails, punch, and bar bites, plus a Rock, Paper, Scissors tournament and live music by Hobo Jazz. The event is sponsored by Frederick Wildman & Sons, so expect the Chartreuse and Ilegal Mezcal to be flowing. The highlight of the event is the second annual Bartenders with Bartabs Auction, featuring top bartenders from across LA donating their time and a $100 gift certificate from their respective bars. The bar tabs are mixed up and the bartenders are auctioned off for drinking dates to the highest bidders. Neat bar owner Aidan Demarest is emceeing the event and auction. “When I worked downtown back in the day at Bar 107, I was closely associated with the LA Burrito Project. Once a year on their anniversary, I used to organize their party as a fundraiser. They were great parties and I would get all the neighboring dive bar bartenders to donate their time and auction off dates with them. We would raise money to help LABP get supplies to continue their work and it was great fun at the same time. Schimek also described the Bartenders with Bartabs auction as a cocktail culture version of the same bartender auctions she used to do through the years in downtown. 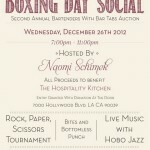 As a nod to the LA Burrito Project, Schimek placed the organization’s tagline, ‘Cause Momma Said Share, at the bottom of the Boxing Day Social flyer. For more information about the Hospitality Kitchen, please visit lacatholicworker.org/visiting-and-volunteering/soup-kitchen.